For kids ages 4 to 11. 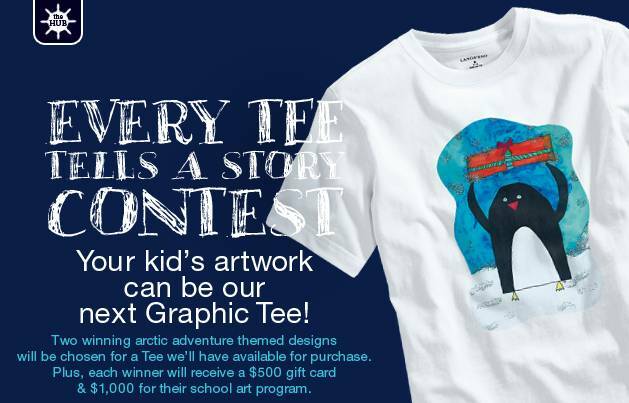 Submit a drawing based on the theme of “Arctic Exploration” for a chance to have your design featured in the next Lands’ End Graphic Tee collection. Equally awesome and another great reason to submit a drawing -- For every entry received, Lands’ End will donate $1 to fund art-related classroom projects at public schools throughout the nation via its partnership with DonorsChoose.org – up to $10,000. Get creating - the contest ends Septemember 7th. For more information visit http://www.landsend.com/thehub/dads/index.html. Be sure to check out the rules and use the official entry form. For all ages. Scribble, Doodle and Draw! In celebration of the newest Taro Gomi books, Chronicle Books is holding an art contest. See the website for full details: http://www.chroniclebooks.com/tarogomi. The contest ends October 31st, 2010. The grand prize (5 available) consists of a Taro Gomi art print, a Faber-Castell Ultimate Sketching and Drawing Gift Set, and full collection of Chronicle's Taro Gomi books and gifts. No painting involved here. Just put on your creativity hats. Submit your idea and let the artist know in 10 words or less what she should paint next. Details at: http://rebekahjoyplett.blogspot.com/2010/08/painting-contest.html Ends September 1st.